The beautiful Hampton Inn Hibbing MN hotel is located just off of Hwy 169 and 73 in the heart of the Iron Range in Hibbing MN. We are just six miles west of the Range Regional Airport and are situated near many of the best Iron Range hospitals including the Fairview University Medical Center and the Essentia Health-Hibbing Clinic. Guests can also can enjoy easy access to the 130 mile long Mesabi Trail. 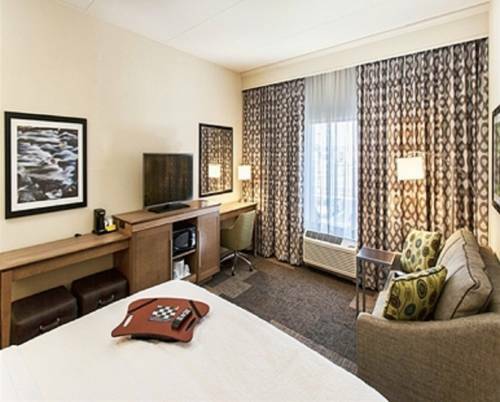 Unwind in a spacious guest room or suite at this Hibbing MN hotel equipped with a microwave refrigerator and ergonomic desk. Check emails with free WiFi and get a great night*s sleep in the clean and fresh Hampton bed. Join us each morning for Hampton*s free hot breakfast featuring our famous fresh-baked waffles. If you*re in a rush pick up a free Hampton*s On the Run Breakfast Bag Monday Friday. The 24-hour Suite Shop stocks a selection of snacks drinks and essentials and there are laundry facilities onsite. Stay connected with free WiFi throughout the hotel and print documents in the 24-hour business center. The 720 sq. ft. meeting room is perfect for business and social events for up to 50 people. Energize with the latest cardio resistance and weights equipment in the free 24-hour fitness room or relax in the sparkling indoor swimming pool or hot tub. Friendly service clean rooms comfortable surroundings every time. If you*re not satisfied we don*t expect you to pay. That*s our commitment and your guarantee. That*s 100 Hampton. The R.W. Lindholm Service Station was designed by the famous architect. It's no Falling Water House, but design features include garage skylights and a tiny observation deck overlooking the St. Louis River.